Rare warehouse find! Only a few units available. Retro-styled, 3 3/4-inch scale action figure celebrating The Twilight Zone episode "Nick of Time." Features 5 points of articulation and includes a Mystic Seer accessory. Limited edition and individually numbered - only 672 pieces! Bring Don Carter to life right before your eyes with our The Twilight Zone Don Carter 3 3/4-Inch Action Figure In Color - Convention Exclusive from Bif Bang Pow!. Designed similar to the action figures released in the '70s, this Don Carter retro-style action figure features 5 points of articulation (neck, shoulder, and hips) and includes a Mystic Seer accessory. 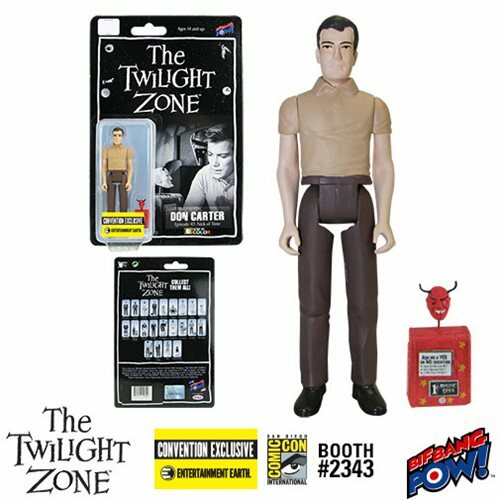 This authentically detailed The Twilight Zone Don Carter 3 3/4-Inch Action Figure In Color - Convention Exclusive is crafted from plastic on a 3 3/4-inch scale. Plus as an Entertainment Earth Convention Exclusive, each limited edition series 4 action figure is individually numbered with a holographic sticker. Order yours today, and relive your favorite moments from this classic episode in your own home. Ages 14 and up.